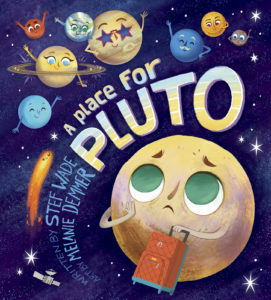 Happy Book Birthday to A PLACE FOR PLUTO by Stef Wade! Stef Wade’s debut picture book A PLACE FOR PLUTO came out July 1st to great reviews and buzz! Pluto got the shock of his life when he was kicked out of the famous nine. His planet status was stripped away, leaving him lost and confused. Poor Pluto! On his quest to find a place where he belongs, he talks to comets, asteroids, and meteoroids. He doesn’t fit it anywhere! But when Pluto is about to give up, he runs into a dwarf planet and finally finds his place in the solar system. This feel-good picture book combines a popular science topic with character education themes of self discovery, acceptance, and friendship. You can order through Barnes & Noble, Amazon, IndieBound or Capstone. Stef Wade used to write about cardboard boxes, but thinks writing books is far more exciting. She was the co-creator and writer for the former cooking and home blog Haute Apple Pie. Stef holds a BA in advertising from Marquette University and an MBA in Integrated Marketing Communication from DePaul University. Stef is a member of the Society of Children s Book Writers and Illustrators (SCBWI). She currently resides in the greater Milwaukee area with her husband and three boys. You can follow Stef on Twitter or go to her website! A PLACE FOR PLUTO will be at Barnes & Noble’s nationwide for National Storytime on August 11th!